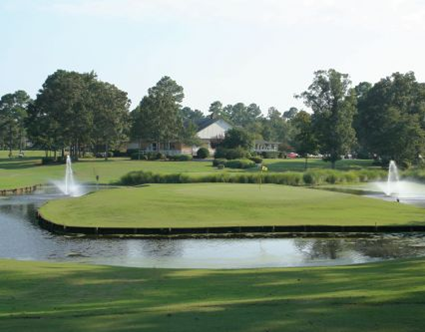 For over two decades Island Green has been a favorite of Myrtle Beach golfers. This 18 hole facility is best known for its perfectly manicured champions greens, superbly conditioned Bermuda fairways , and its namesake island green finishing hole. However, the course is not overly difficult, making it enjoyable for all golfers. Island Green is built upon gently rolling terrain accented with an abundance of azaleas and dogwoods. It is conveniently located off of Hwy. 707 near Surfside and Garden City in the Myrtle Beach area. This Bill Mooney design offers challenging and memorable golf. Island Green also has a full service bar and grill offering daily breakfast, lunch and happy hour specials.